The Fujits fi-6750S is a simplex ADF entry model scanner that is intended to meet the needs of the cost conscious end-user. It is ideal for cost sensitive companies and offices that primarily scan one sided documents. In addition to enhancing the variation of the fi-Series line-up with its cost-performance effectiveness, the fi-6750S' virtual duplex ADF scanning function enables it to duplicate duplex scanning while scanning one side at a time. The fi-6750S's bundled barcode and patchcode reading functionality enables it to separate different jobs with its automatic job separation function. The result is improved digitizing efficiency. 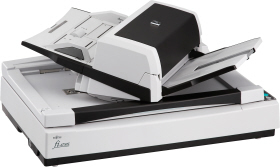 In addition to being loaded with a function that ensures that trapezoid-shaped documents as well as index tab and sticky note attached documents are scanned in their entirety, the fi-6750S supports a function that removes the circular and angular punch hole representations that are created from scanning loose-leaf sheets, courier service forms and other similar documents.